Hardy Aberdonian swimmers will get the chance to brave the cold of the North Sea with a new date set for the Nippy Dip. 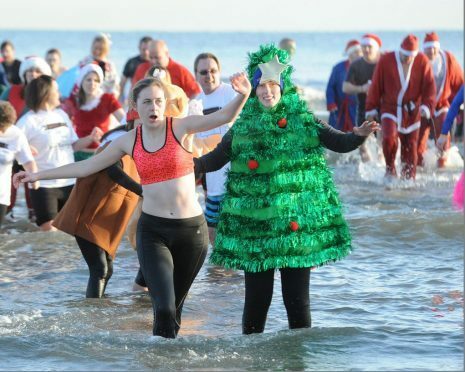 Once again, Aberdeen Lions Club organised an event for hardy souls to brave the elements on Boxing Day by taking part in a sponsored Dip in the chilly North Sea. However, this year due to adverse weather conditions it was decided that the dip should be cancelled on Boxing Day itself owing to Safety concerns. It is now planned that the event will take place on the January 2 instead and that the weather will be more suitable. Last year around 170 ‘Nippy Dippers’ raised over £14,000 for a wide variety of deserving causes. Participants will be raising funds for their own charity or good cause, or supporting the Lions Club’s designated charity, the Lord Provost’s Charitable Trust. Dippers take part singly or in teams and some return each year. Many wear Fancy Dress. This year’s Dip will still take place opposite the Beach Leisure Centre and, once again, Sport Aberdeen are kindly providing use of the centre’s showers and changing rooms. The participants will be heading down into the icy waters around 10.30am. Spectators are encouraged to come along and cheer on the hardy souls. The Lions Club will collect all monies raised on the day and make a formal presentation to the charities early in the New Year. Further information and registration forms can still be obtained from 01224 869557, email aberdeenlions@hotmail.co.uk.